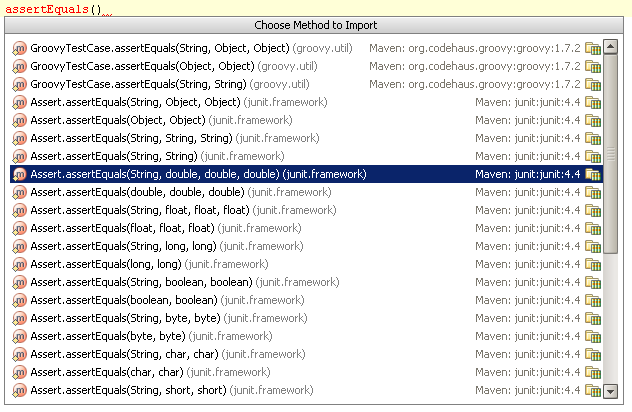 When writing JUnit 4.x tests, you'll likely use assertion methods like assertEquals(). It's common to use static imports for such methods, to keep the test code concise and readable. These static import popups have a lot of noise. While there are many overloaded variants of assertEquals(), it does not matter which one I choose (ignoring for the sake of argument the groovy variants in the popup I got). In the end, the same "import static junit.framework.Assert.assertEquals;" line will be inserted. Are there any plans to make this popup a bit friendlier in IDEA 10? Alexey, I don't see the change in #96.156. Do I need to enable some specific option/setting? It works well. I've entered http://youtrack.jetbrains.net/issue/IDEA-54800 for a small improvement. When working with JUnit/Mockito/EasyMock/Hamcrest/etc, getting convenience methods statically imported can still be painful. Are there any plans to experiment with such approaches for IDEA 10? This is a tricky problem, as most solutions have downsides as well. Thanks for the fix - much better. Of course, positive/negative feedback from other IDEA users would be much appreciated as well.